I hate cooking bacon in a skillet. 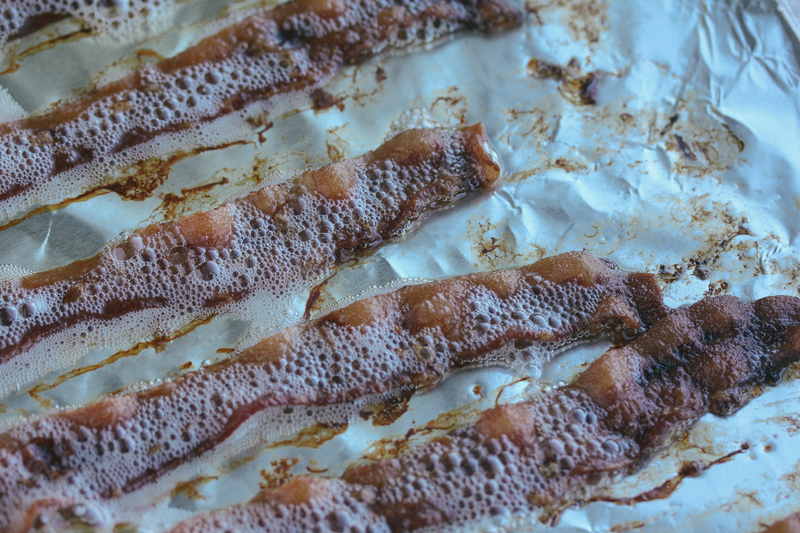 It gets bacon grease everywhere and your stove is left a mess. We cook bacon so much in our house that we had to find a different way to cook it, otherwise our stovetop would be a permanent greaseball. 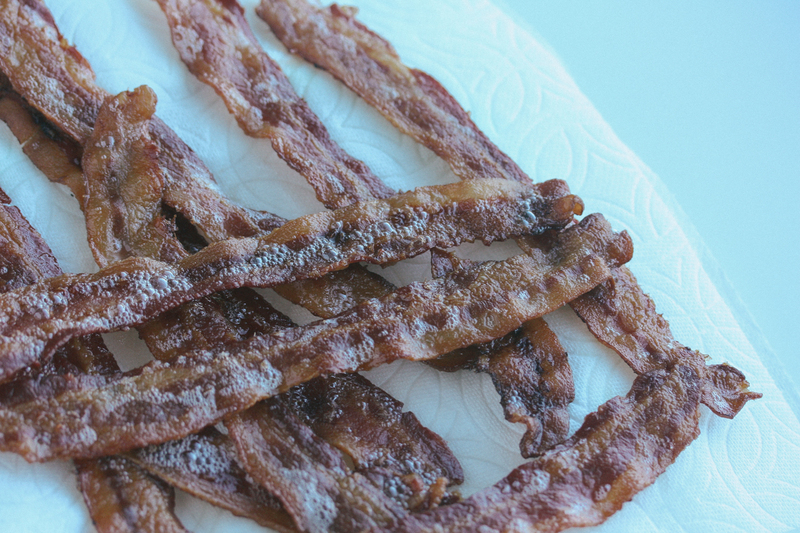 After googling other ways to make bacon, the one trend I saw the most was to bake it. Now there’s a bunch of different ways to do this and a million posts on google about how to bake bacon, but I wanted to share my way of how we’ve been doing it for literally the past few years. This is the greatest way to cook bacon because you can literally set it and forget it (until the timer goes off). You don’t have to flip it or anything. Sure your oven will get really dirty overtime, but who cares at least it’s not the stovetop! DO NOT PREHEAT YOUR OVEN. I’m not sure why this works so well but this is the way we do it and this works the best: don’t preheat your oven. You will turn it on when you put the bacon in the oven. 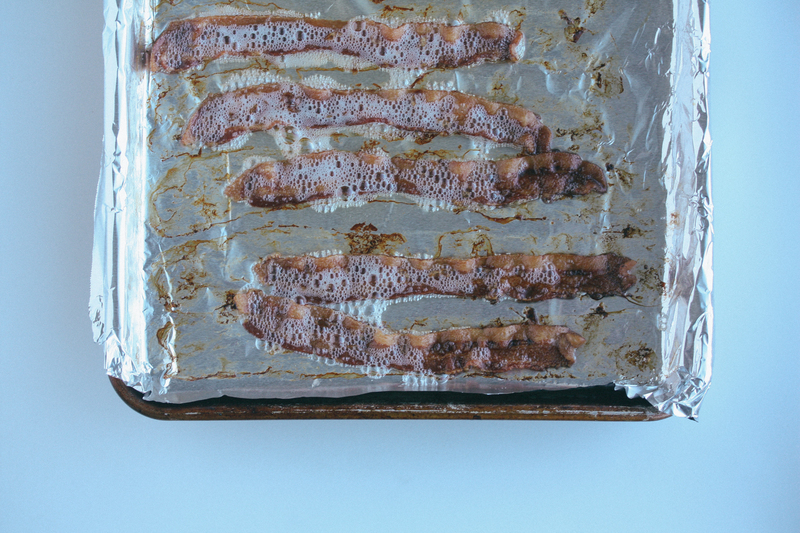 But first line a baking sheet with a big piece of foil so you can keep or dispose of the bacon fat once you’re done very easily. 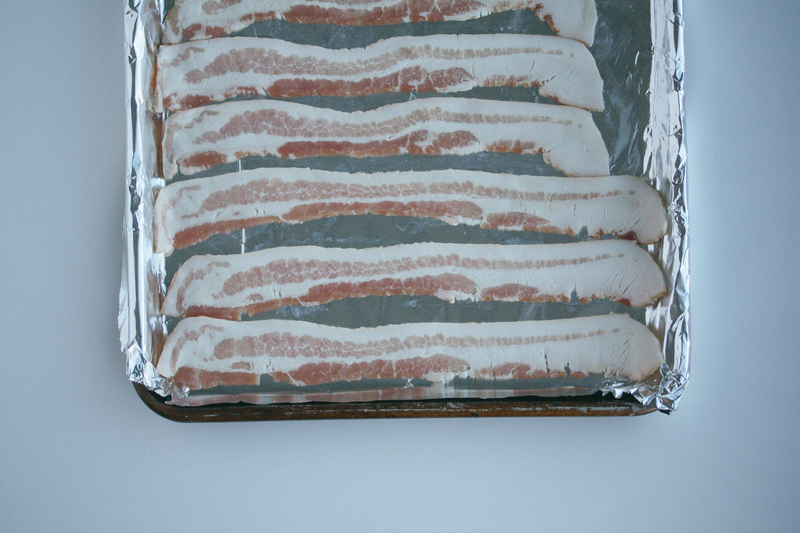 Once the baking sheet is lined, load it up with bacon. We pretty much fit as much as we can on there but 10–12 pieces is a good number to go by. Then put it in the oven and turn the oven to 400°. Then set a timer for 15 min. After 15 min look at the bacon and see if you need to keep it in there longer. This time will totally depend on your oven because all ovens are different. My oven normally takes about 18–20 minutes. But I suggest checking first at 15 minutes if you’ve never done this before. Then just keep checking on it every 2 min until it’s golden brown or your desired doneness. 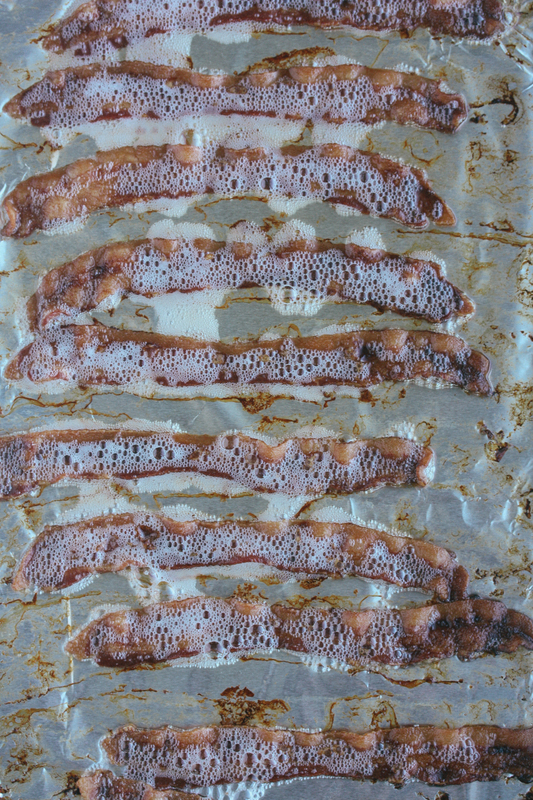 Once it’s done to your liking, pull it out of the oven and use some tongs to put the bacon on a couple pieces of paper towels to dry, crisp up and drain.. Give it a couple minutes, then dig in! Getting out the door quickly in the morning is already a challenge. Then if you try to add breakfast in the mix it becomes even more of a challenge. Then if you try to add a healthy breakfast in the morning it becomes even more more of a challenge. I think it’s important to understand what I mean by healthy breakfast. So often people think a muffin or pastry or some other glucose spiking carb fest is what we need for breakfast. Contrary to conventional wisdom, a whole grain muffin isn’t a healthy breakfast option. We need protein and fat to get us going in the morning, but we need something that we can whip up in a couple minutes, otherwise we will be grabbing for the doughnuts when we arrive at the office. 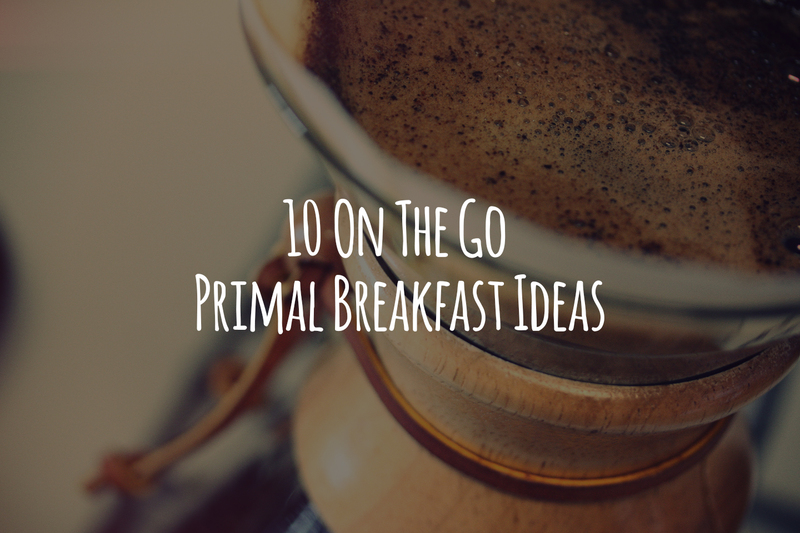 Check out some quick on the go breakfast ideas below. I know you may think that this takes longer than a few minutes but it can actually go pretty quickly. 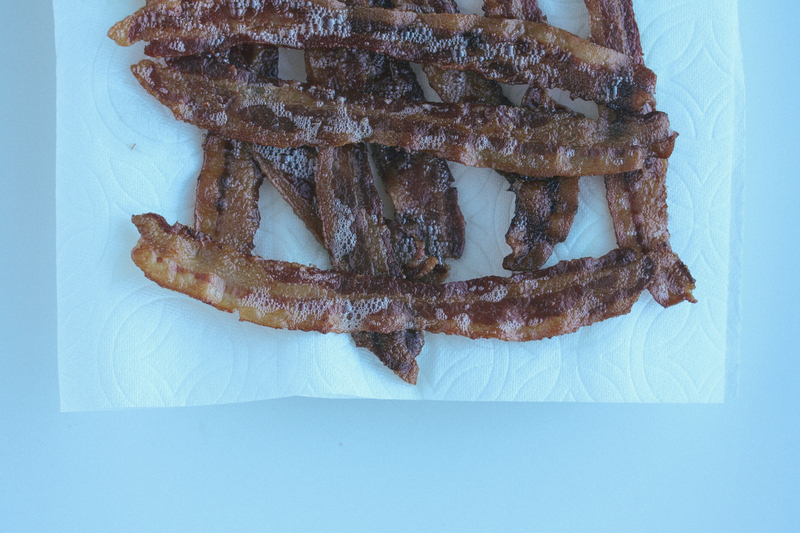 The key is to bake your bacon the night before or on Sunday and save it for using throughout the week. If you do this you can whip this up pretty quickly, especially if you follow Gordon Ramsey’s way of making scrambled eggs. Just throw some butter and eggs in a skillet, scramble for a couple minutes and toss the crumbled bacon in near the end. Once it’s done, throw it in a to go cup and eat it while you’re driving. Maybe not the safest option, but it’s better than getting type 2 diabetes from eating a muffin every morning. This is an even faster option. I like this whey protein because it contains fat in it as well as protein. Most whey proteins use some fake fat instead of a real fat like coconut. Toss a couple scoops in a shaker like this and you’re good to go. I’ve already written about both of these here, here and here. These are both great options for breakfast on the go because they have a good amount of fat and protein. Pair this with some coffee and you’re ready to go all morning long. I saw this on Mark’s Daily Apple awhile ago around the same time people were doing bullet proof coffee and I think the idea is genius. Basically you mix 3 egg yolks with your coffee and then add a little sweetener like stevia or honey. It’s like bulletproof coffee plus a little protein kick. Remember though if you do this to use pastured egg yolks for less of a risk of food born illness or salmonella. Speaking of bulletproof coffee… So you don’t always need protein to get going in the morning. Sometimes all you need is a good dose of fat and caffeine. You can read more about bullet proof coffee here. Prepare these Sunday and you’re good to go all week. You’d even be further ahead of the game if you pre peel them so you can eat them in the car. This is like the ultimate on the go meal. You can always make your own or pick up some good brands like Krave at your local gas station or Target. My wife and I make this a lot for our daughter, but it’s perfect for you to whip up in less than 5 minutes and head out the door. I do have version of this recipe that I’m gonna post in the near future that has cricket flour as the protein source, but for now you can find the recipe I follow here. I’ve made this a few times and man are they good. They have a nice crunch and a good dose of fat. A little messy because they are frozen but I ended up eating these so quickly that it didn’t matter how messy they were. Find the full recipe here. Now I’m not talking about cannibalism, I’m suggesting that you practice intermittent fasting from time to time. You don’t always have to eat breakfast. If you’re body is a fat adapted, your body can switch to using stored body fat for energy instead of relying on sugar (carbs). It’s a common misconception that we need breakfast and that it’s the most important meal of the day. It’s not the most important meal of the day. There it is folks. 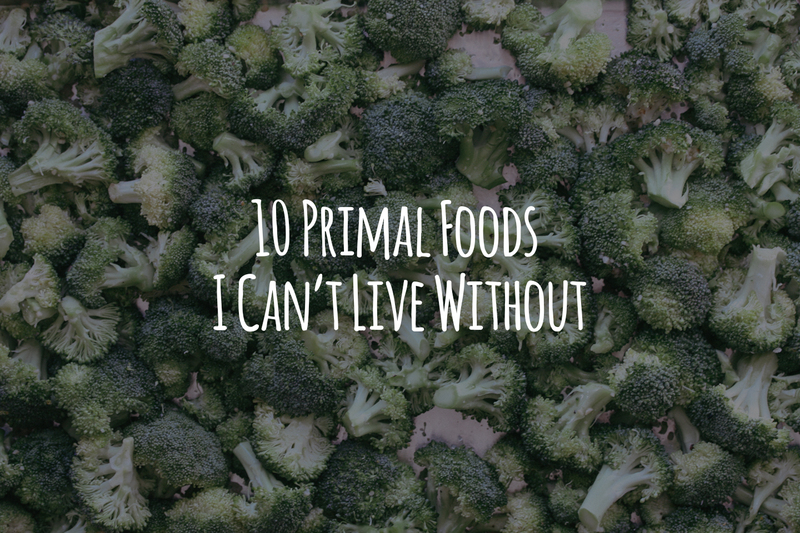 Hopefully these 10 ideas will help you out in the morning to steer clear of the muffins or doughnuts at the office. If you arrive to work full and energized you’ve already won the battle!